The music video won accolades from various award-giving bodies like Mnet Asian Music Awards and Melon Music Awards. The music video is directed by Cho Soo-hyun, who also directed the music video for Psy's follow-up single "Gentleman" and the music video for "This Love" by Shinhwa. It shows Psy performing a comical horse-riding dance and appearing in unexpected locations around the Gangnam District, such as an outdoor yoga session and a hot tub. He wears several distinctive suits and black sunglasses with a mindset of "dress classy and dance cheesy". It features a "skewering [of] the Gangnam image" by the "non-Gangnam Psy"; this parody would be recognizable to viewers familiar with Korean culture. Although there are more than ten different locations featured, only two of the scenes are actually filmed in the Gangnam district. The sauna scene, elevator scene and bathroom scene were filmed elsewhere in the greater Seoul region, and some shots were filmed in World Trade Center Seoul and the Songdo International Business District, which includes Songdo Central Park and International Business District Station. The video was shot over 48 hours in July 2012. Comedian/television personality Noh Hong-chul, who does his trademark pelvis-thrusting dance in an elevator while Psy raps underneath him. The video starts out with Psy, who is lounging at what looks like a sandy beach, under a sun umbrella and holding a cold drink, but the camera zooms out to reveal he is actually at a playground. The video then alternates between the playground, where a boy (Hwang Min-woo) dances next to him; and a row of horses in stalls, where Psy performs his signature "invisible horse dance". As Psy (and two girls) walk through a parking garage, they are pelted by pieces of newspaper, trash, and snow. At a sauna, dressed in a blue towel, he rests his head on a fat man's shoulder while another man covered in tattoos is stretching. He then sings in front of two men playing Janggi (Korean chess), dances with a woman at a tennis court and bounces around on a tour bus of seniors. The scenes alternate quickly until there is an explosion near the chess players (portrayed by Big Bang members Seungri and Daesung), causing them to jump off the bench. Psy immediately walks towards the camera, pointing and shouting "Oppan Gangnam Style". The chorus starts as he and some dancers perform at a horse stable. He dances as two women walk backwards. He dances at the tennis court, a carousel, and the tour bus. He shuffles into an outdoor yoga session and on a boat. The camera zooms in on a woman's buttocks, then shows Psy "yelling" at it. Video views per week, illustrating viral growth to peak viewership in the eleventh week. "Gangnam Style" reached the unprecedented milestone of one billion YouTube views on December 21, 2012. A spoof documentary by videographer Simon Gosselin was posted on YouTube and had promoted 2012 doomsday rumors across social media services such as Facebook and Twitter that linked "Gangnam Style" to a fake Nostradamus prophecy. On December 21, at around 15:50 UTC, the video's YouTube page updated with 1,000,382,639 views. 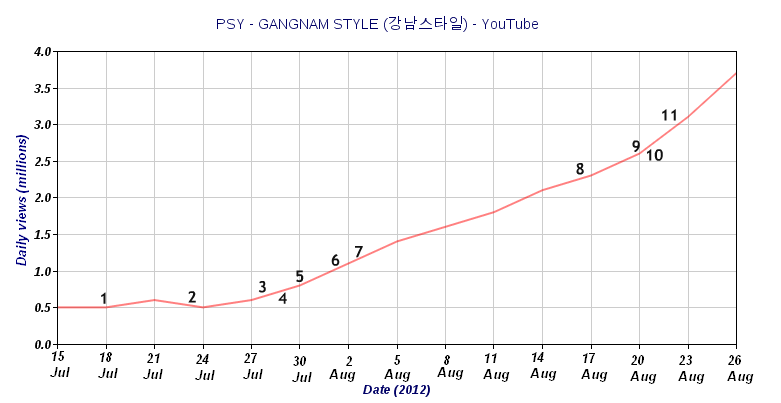 YouTube specially marked the video's accomplishments with a cartoon dancing Psy animated icon, added first by the site logo, and later next to the video's view counter when it exceeded a billion views. On April 6, 2013 the video on YouTube reached 1.5 billion views. On June 1, 2014, the music video reached two billion views. On December 3, 2014, the video reached 2.1 billion views (close to the largest representable number in a 32-bit binary number), and YouTube jokingly wrote on Google+ that it had to change the view counting system to prevent an integer overflow. In fact, YouTube had already updated to a 64-bit integer months before. On January 19, 2016, the video reached 2.5 billion views. On November 25, 2017, the video surpassed 3 billion views. According to a research by Eötvös University and Ericsson Research in Hungary; and Massachusetts Institute of Technology in the United States, the geographical source of the viral spread of the video is the Philippines and not in South Korea where the video was produced. The researchers concluded the origin of the viral spread after analyzing data in Twitter and verifying the spreading pattern through Google Trends. The music video of "Gangnam Style" has been met with positive responses from the music industry and commentators, who drew attention to its tone and dance moves, though some found them vulgar. Another notable aspect that helped popularise the video was its comical dance moves that can be easily copied, such as the pelvic thrust during the elevator scene. The United Nations hailed Psy as an "international sensation" because of the popularity of his "satirical" video clip and its "horse-riding-like dance moves". As such, the music video spawned a dance craze unseen since the Macarena of the mid-1990s. The World Bank's lead economist David McKenzie remarked that some of Psy’s dance moves "kind of look like a regression discontinuity", while the space agency NASA called "Gangnam Style" a dance-filled music video that has forever entered the hearts and minds of millions of people. Melissa Locker of Time noted that "it's hard not to watch again ...and again ...and again", while CNN reporter Shanon Cook told the audience that she had watched "Gangnam Style" about 15 times. As of January 2015, Billboard named the video as one of the 20 best music videos of the 2010s (so far). ^ In the Rolling Stone interview, Psy says he copied the spa surfacing scene from the music video for Lady Gaga's "Poker Face". ^ "Gangnam Style". iTunes. Psy. 19 October 2012. Retrieved 21 August 2014. ^ "Pinpointing Five Locations in Seoul from the Music Video, 'Gangnam Style'". Jaunted.com. JetSetCD. 29 August 2012. Retrieved 21 August 2014. ^ "Exclusive: Psy 'Can't Believe' 'Gangnam Style' Broke 1 Billion Views". MTV. James Montgomery. 21 December 2012. Retrieved 21 August 2014. ^ "At 2 Billion Views, 'Gangnam Style' Has Made Psy A Very Rich Man". Forbes. Hugh McIntyre. 16 June 2014. Retrieved 21 August 2014. ^ Hong, Grace Danbi (8 May 2013). "Fujii Mina to be Shinhwa's Lady in 'This Love' music video". enewsWorld. CJ E&M. Retrieved 21 August 2014. ^ Surh, Jung-min (August 8, 2012). "'Gangnam style' goes viral". The Hankyoreh. Hankyoreh Newspaper Corp. Retrieved 21 August 2014. ^ a b c d e Ramstad, Evan (August 3, 2012). "What's Up with the 'Gangnam Style' Video?". The Wall Street Journal. Dow Jones & Company. Retrieved 2012-08-10. ^ "There's No 'Gangnam' Seen in Psy's 'Gangnam Style' MV?!". KpopStarz. September 12, 2012. Retrieved 21 August 2014. ^ 안종훈 (23 August 2012). 싸이 '강남스타일' 뮤직비디오 촬영지 인기. Nocutnews (in Korean). Retrieved 21 August 2014. ^ a b c d e Garibaldi, Christina (September 17, 2012). "Psy Breaks Down Greatest Assets of 'Gangnam Style'". MTV News. Retrieved 21 August 2014. ^ a b c d e f g Knopper, Steve (September 14, 2012). "Breaking down Psy's 'Gangnam Style'". Rolling Stone. Retrieved 21 August 2014. ^ a b Fisher, Max (August 23, 2012). "Gangnam Style, Dissected: The Subversive Message Within South Korea's Music Video Sensation". The Atlantic. Atlantic Media Company. Retrieved 21 August 2014. ^ "Who's the dancing kid in Psy's 'Gangnam Style' MV?". AllKpop.com. August 29, 2012. Retrieved 21 August 2014. ^ Lee, Sungeun. "'Little Psy', 7, Grabs 'Gangnam Style' Spotlight". ABC News. Retrieved 21 August 2014. ^ "Invisible Horse Dance: The Business of 'Gangnam Style'". Knowledge@Wharton High School. University of Pennsylvania. September 27, 2012. Retrieved 21 August 2014. The signature move of the video has been called the 'invisible horse dance' because it mimics a bouncing/riding movement with hand gestures of alternating holding reigns and lassoing. ^ "Charts – Music – YouTube, Most viewed videos, week of August 28, 2012". YouTube. Retrieved 21 August 2014. ^ "Popularity of Psy's 'Gangnam Style' Analyzed Realistically". KpopStarz. September 2, 2012. Retrieved 21 August 2014. ^ Allocca, Kevin (21 August 2014). "YouTube Trends: Gangnam Style vs Call Me Maybe: A Popularity Comparison". YouTube Trends. YouTube. Retrieved 2012-09-14. ^ "Psy's 'Gangnam Style' most-viewed video on YouTube". Yonhap News Agency. Retrieved 21 August 2014. ^ a b c d Ramstad, Evan (September 7, 2012). "Canadians in South Korea fund expansion of popular website". The Wall Street Journal. Dow Jones & Company. Retrieved 21 August 2014. ^ a b Zimmerman, Neetzan (July 30, 2012). "Did This Underground Hip Hop Artist from South Korea Just Release the Best Music Video of the Year?". Gawker. Gawker Media. Archived from the original on November 26, 2012. Retrieved 21 August 2014. ^ a b "T-Pain, Robbie Williams, Josh Groban, and Gawker Show Love for Psy's "Gangnam Style"". Soompi.com. August 1, 2012. Retrieved 21 August 2014. ^ Day, Lara (September 12, 2012). "'Gangnam Style's Psy Appears on 'Ellen', Schools Britney Spears". The Wall Street Journal. Dow Jones & Company. Retrieved 21 August 2014. ^ "Tom Cruise Considering Psy as a Future Co-Star?". Mnet. CJ E&M Corporation. September 5, 2012. Retrieved 21 August 2014. ^ Joseph Gordon-Levitt [@hitRECordJoe] (September 12, 2012). "#EndlessGangamStyle #Again #AndAgain" (Tweet). Retrieved 21 August 2014 – via Twitter. ^ Dayal, Geeta (December 15, 2012). "William Gibson on Punk Rock, Internet Memes, and 'Gangnam Style'". Wired. Retrieved 21 August 2014. ^ a b Ramstad, Evan (August 6, 2012). "'Gangnam Style' Video Brings Attention to Fan Reaction Videos Too". The Wall Street Journal. Dow Jones & Company. Retrieved 21 August 2014. ^ "How 'Gangnam Style' Went Viral". The Wall Street Journal. Dow Jones & Company. August 8, 2012. Retrieved 21 August 2014. ^ Jurgensen, John. "'Gangnam' Mania". The Wall Street Journal. Dow Jones & Company. Retrieved 21 August 2014. ^ Hicap, Jonathan M. (September 24, 2012). "Guinness World Records Declares 'Gangnam Style' as 'Most Liked' Video in YouTube History". Manila Bulletin. Manila Bulletin Publishing. Retrieved 21 August 2014. ^ "Words cannot even describe how amazing this video is..." Reddit. Archived from the original on 26 November 2012. Retrieved November 26, 2012. ^ "Trying to Figure out which Tracks Stay on the Album". RobbieWilliams.com. Retrieved 21 August 2014. ^ "Unohtakaa Macarena, tässä tulee hevostanssi!". Iltasanomat (in Finnish). Sanoma News. July 28, 2012. Archived from the original on November 26, 2012. Retrieved 21 August 2014. ^ T-Pain. "Words cannot even describe how amazing this video is..." Twitter. Archived from the original on November 26, 2012. Retrieved 21 August 2014. ^ Sullivan, Andrew (August 1, 2012). "Mental Health Break". The Daily Beast. Archived from the original on 26 November 2012. Retrieved 2012-10-01. ^ "Rapper living 'Gangnam Style' goes viral". CNN. August 3, 2012. Retrieved 21 August 2014. ^ Katy Perry [@katyperry] (August 21, 2012). "Help, I'm in a gangnam style k hole" (Tweet). Retrieved 21 August 2014 – via Twitter. ^ a b Raw data accessed September 2, 2018 from Wayback Machine archives of YouTube video page stored by archive.org (click on year 2012 or 2013). ^ "End of the world: Gangnam Style?". Agence France-Presse. Retrieved 21 August 2014. The only hiccup is this so-called thesis writer is actually Simon Gosselin, a blogger and videographer who invented everything for fun. ^ "Psy's Gangnam Style indicating Dec 21 doomsday?". India Times. Agence France-Presse. December 5, 2012. Retrieved 21 August 2014. An obvious fake, the quote has its origins in a spoof five-minute "documentary" posted on YouTube that has garnered up 1.5 million views and ties Nostradamus and Psy to the December 21 apocalypse prophesied by the Mayans. ^ Gruger, William (December 18, 2012). "'Gangnam Style' Leads YouTube's Top Trending Videos of 2012". Billboard. Retrieved 21 August 2014. While browsing videos on YouTube the past day you may have noticed that the site's icon in the upper lefthand corner has been taken over by a .gif of PSY and his all too familiar dance. ^ Choi Ji-Ye (2013-04-06). "싸이 '강남스타일', 유튜브 15억뷰…27일만에 1억 추가". mydaily. Retrieved 2013-04-06. ^ Conlon, Kevin (June 1, 2014). "Modern milestone: 'Gangnam' hits 2 billion". CNN.com. Retrieved 21 August 2014. ^ Lee, Timothy B. (2014-12-03). "Gangnam Style got so many views that it nearly broke YouTube". Vox. Retrieved 2016-05-28. ^ "'Gangnam Style' breaks YouTube with 2.1 billion views". Kicker. 2014-12-03. Retrieved 2016-05-28. ^ Dimacali, TJ (July 26, 2017). "Pinoys to blame for Gangnam Style's viral success". GMA News Online. Retrieved July 26, 2017. ^ a b Emerging Technology from the arXiv (July 25, 2017). "How did Psy's "Gangnam Style" video conquer the world in 2012? Researchers now think they know". MIT Technology Review. Retrieved July 26, 2017. ^ Kallus, Zsofia; Kondor, Daniel; Steger, Jozsef; Csabai, Istvan; Bokanyi, Eszter; Vattay, Gabor (July 14, 2017). "Video Pandemics: Worldwide Viral Spreading of Psy's Gangnam Style Video". ICT Innovations 2017. Communications in Computer and Information Science. 778. Springer. pp. 3–12. arXiv:1707.04460. doi:10.1007/978-3-319-67597-8_1. ISBN 978-3-319-67596-1. ^ "Despacito is now the most watched YouTube video of all time, breaking 3bn view barrier". The Drum. Retrieved 2017-09-27. ^ "Justin Bieber to record US version of Psy's 'Gangnam Style'?". MediaCorp Interactive. August 14, 2012. Retrieved 21 August 2014. While the music video has been viewed over 28 million times on video sharing site YouTube, and has been praised for its catchy rhythm as well as its wacky 'horse dance', not everyone is impressed – his detractors have labelled his music vulgar. ^ Mahdawi, Arwa (September 24, 2012). "What's so funny about Gangnam Style?". The Guardian. London. Retrieved 21 August 2014. ^ "From Korean pop music to skydiving to Earth – not-your-typical diplomatic meetings for UN Secretary-General". United Nations. October 24, 2012. Retrieved 21 August 2014. ^ Bellini, Jerrett (October 15, 2012). "Apparently This Matters: R.I.P., 'Gangnam Style'". CNN. Retrieved 21 August 2014. ^ "Gangnam Style is the latest craze to sweep across dancefloors". News.com.au. September 22, 2012. Retrieved 21 August 2014. ^ McKenzie, David. "Gangnam Migration: Regression-Discontinuity Impacts of Migrating to Korea". World Bank. Retrieved 21 August 2014. ^ "Johnson Space Center Pathways Interns Create 'Gangnam Style' Parody". NASA. Retrieved 21 August 2014. ^ Locker, Melissa (August 22, 2012). "WATCH: Psy Brings 'Gangnam Style' to Dodger Stadium". Time. Retrieved 21 August 2014. ^ "Dank Katy Perry: US-Erfolg für koreanischen Sänger Psy". Der Spiegel (in German). Spiegel Verlag. August 24, 2012. Retrieved 2012-09-26. ^ Judkis, Marua (August 23, 2012). "'Gangnam Style's invisible horse dance craze: Giddyup". The Washington Post. Retrieved 21 August 2014. ^ Knopper, Steve (21 August 2014). "On the Charts: 'Gangnam Style' Is All the Rage". Rolling Stone. Retrieved 2012-10-13. ^ Fekadu, Mesfin (August 23, 2012). "Viral clip gives Korea's PSY a pop culture moment". Huffington Post. AOL. Associated Press. Retrieved 21 August 2014. ^ Buchanan, Matt; Ellis, Scott (August 28, 2012). "Hit video may have a subversive message". The Sydney Morning Herald. Fairfax Media. Retrieved 21 August 2014. This is an almost Dada-esque series of vignettes that make no sense at all to most Western eyes. Psy spits in the air while a child breakdances, sings to horses, strolls through a hurricane that shoots whipped cream in his face, there's [sic] explosions, a disco bus, he rides a merry-go-round, dances on boats, beaches, in car parks and in elevators and generally makes you wonder if you have accidentally taken someone else's medication. ^ Netburn, Deborah (August 28, 2012). "'Gangnam Style' live: New Psy video blows up on YouTube". Los Angeles Times. Tribune Co. Retrieved 21 August 2014. I think we can all agree that K-Pop singer Psy's music video 'Gangnam Style' is one of the greatest videos ever to be uploaded to YouTube. ^ "The 20 Best Music Videos of the 2010s (So Far)". Retrieved January 15, 2015.